Sig being sorta new (still) to the optics world, I take my sweet time before I publish publish reviews of their products. I spend a significant amount of time using the optics I review and the newer the brand the longer I take. I am sure the guys at Sig do not like it, but I think a little extra diligence is worth my time. I’ve been doing sort of a market overview of different 4x prism sights and I think Sig is the last one I needed to cover for it to be fairly complete. Check out the video below and then the spec table and some additional commentary immediately after. Most of the comparison was between Sig and Elcan, but I also had the Leupold HAMR on had for a little bit, so I had them side by side. Optical quality was similar, but Sig is definitely the larger sight. I do not talk much about Browe, but it is effectively a re-hash of Trijicon 4×32 with a bit more clever electronic integration and the things I do not like about the 4×32 ACOG carry over to the Browe optic. I think the only 4x prism sight I have not messed with yet is the newish Bushnell Accelerate which really competes in a different price bracket. I will try to get my hands on one before I move to 3x or 5x prism scopes that seem to be getting somewhat numerous. One of the reasons I like sights like this is the balance. 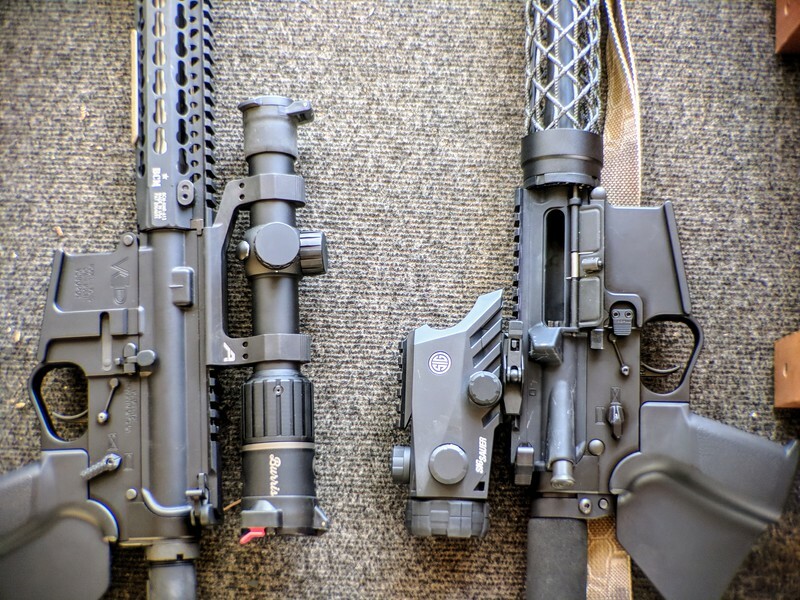 In the picture below, Bravo4 is next to Burris RT-6 which is one of my favourite inexpensive 1-6×24 scopes. There may not be all that much of a difference in weight, but the weight of a prism scope is further back, so it effects the balance less. In a nutshell, I liked the Bravo4 a lot. It does a lot of things well and very few things badly, but the outstanding feature I keep on coming back is that enormous immersive field of view. If this is the type of scope you like, you owe it to yourself to check it out. 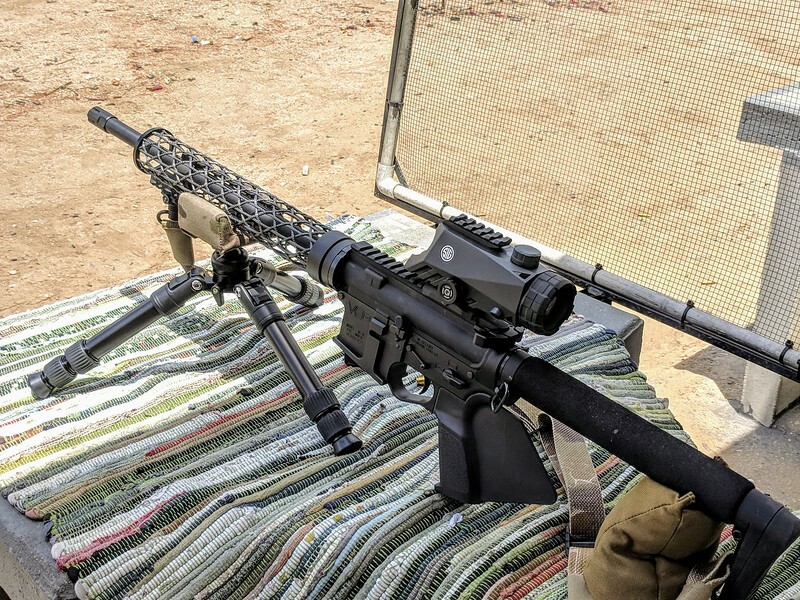 It is not replacing Elcan on my rifle yet, largely because I really like to shoot pretty far out with it and Elcan is a better precison scope between the two. I also like the dual mode illumination system of the Elcan, where with a bright center dot I can use it the Byndon aiming concept and with dim full reticle illuminatoin I can easily use the whole reticle at night. That having been said, I already have the Elcan. I’ve had it for a number of years and I have a lot of trust in it based on experience. If I were just starting out now and given that Bravo4 is around $400 less, this would have been a very difficult choice. I will, however, take the Sig over the 4×32 ACOG. Wide FOV and comparative ease of getting behind it, really give Bravo4 an edge. In all fairness, it is a newer design, so it better have something on its primary competitor. I am very curious to see what kind of aftermarket support Bravo4 will get, but I already see a beefier dual lever mount out there and I am sure more accessories will come. I would really like to see a lower red dot mount. With all that, my criticism of Bravo4 is really minimal. I like this sight a lot and it easily earns my recommendation.